Why Does Baltimore City Want to Take The Show-Your-Soft-Side Campaign from Sande Riesett? I think I know something about the Show Your Soft Side Campaign. I was there when Sande Riesett of Outlaw Advertising conceived the idea. One day in the Spring of 2011, Sande contacted me and asked if I’d like to be the photographer for an anti-animal abuse campaign she was thinking of launching. Sande, a true animal lover, had seen a number of incidents of animal abuse in Baltimore city, and she wanted to do something about it. Her idea? 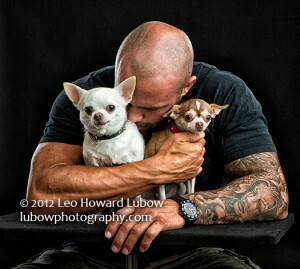 To assemble a team (consisting of a graphic designer, a photographer, a promoter, and herself) to create billboards and posters showing tough-guy role-models in loving relationships with their pets. The campaign would be pro bono. Every net dollar would be given to animal shelters and anti-animal abuse causes. Great idea. Great people. I was in. Since then, Sande has worked day in and day out on the campaign. She meticuously refreshes the Show Your Soft Side Facebook page with news articles, stories and anecdotes, and as a result, the page receives hundreds of thousands of hits each week. Visit Soft Side’s Facebook page in the morning and go back five hours later. It will be different. That’s Sande, sitting at the computer, seven days a week, sending out her message. The city is teeming with Soft Side images and headlines – on buses and billboards, at bus stops and rail stops, and inside our stadiums. That’s tens of thousands of dollars and more of vital space, sending out the Soft Side message. It’s there through Sande’s blood, sweat and tears. Have you ever visited one of our many festivals during the dog days of Summer when the temperature closes in on 100? If you have, you’ve seen a friendly blonde-haired woman standing in the Soft Side booth where you can buy a poster for $5.00. That woman is Sande, and whatever she weighed that morning, she weighed five pounds less by the end of the day. I also promise you this: whatever time you left the festival, she was still there. Have you ever been to a Soft Side Charity event? Each season at least one is held, where you can attend, socialize, eat, drink, and meet some of the “Softies,” from MMA figher/promoter John Rallo to Baltimore Raven Torrey Smith. Can you guess who conceived of these events? Can you guess who was instrumental in setting them up? 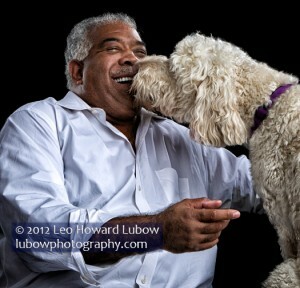 This past weekend the Soft Side team went to NYC to shoot two subjects for upcoming billboards. Every dollar spent on that trip came from the personal pockets of the Soft Side members. No member of the Soft Side team has earned a dollar from the campaign. Quite the contrary, everyone, and most of all, Sande, is out of pocket. Since the Fall of 2011, I’ve spent hundreds of hours working with Sande to create most of the photographs used in the Soft Side campaign. After each shoot, we review the photographs. More specifically, we put on our gloves and spar. “I like this one, Sande.” “No Leo, look at this, where he’s cradling the puppy in his arms. How cute is that?” “But Sande, look at the little one in no. 5238. You see those big eyes?” Back and forth we go. Fighting and fighting and fighting. I’ve never worked for an advertising person like Sande. I wish we could clone her. What has Baltimore City done in this campaign? I couldn’t say. I’ve never worked with them nor seen them expend any efforts on the campaign. The only exception is the time I saw a newsclip of the Mayor at a press event. Today, 26 June 2013, I read an article in the Baltimore Sun. The article states that Sande filed an action in Federal court to establish that she, not Baltimore City, owns the intellectual property that is the Soft Side Campaign. In the article, Ryan O’Doherty, a spokesperson for Mayor Stepanie Rawlings, is quoted as saying that “[h]opefully, this is not an effort to privatize and monetize a city public asset.” This person could not know Sande Riesett. This person could not know what Sande has given of herself for Soft Side. This person should rethink what he stands for. The Soft Side Campaign is Sande Riesett’s creation. It is her child, her message, her intellectual property. True to her nature, she offered to freely license the campaign to Baltimore City. But the City and its officials want more. They want to take her creation and claim it for themselves. 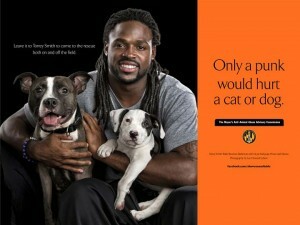 To their mind, it is apparently unacceptable to spread the Soft Side message beyond Baltimore. Why is the city taking this postion? To what end? Who benefits? Answer these questions and you answer the larger question of who is right and who is wrong and what is really happening here. Baltimore Mayor’s office refuses to endorse Commission Report criticizing City’s anti-animal abuse efforts. In protest, Chairman Caroline Griffin resigns. See click here and click here. Shame on you City of Baltimore! Charm City? I think not. I volunteer for an animal rescue in MN. After reading how money and idea grubby the City of Baltimore seems to be, won’t be visiting there any time soon.